Memorial League of Welldoers Limekiln Lane from Penrhyn Sch. 42 Elias St.Kirkdale (Grandad George m. Esther Price from 113 Elias St. 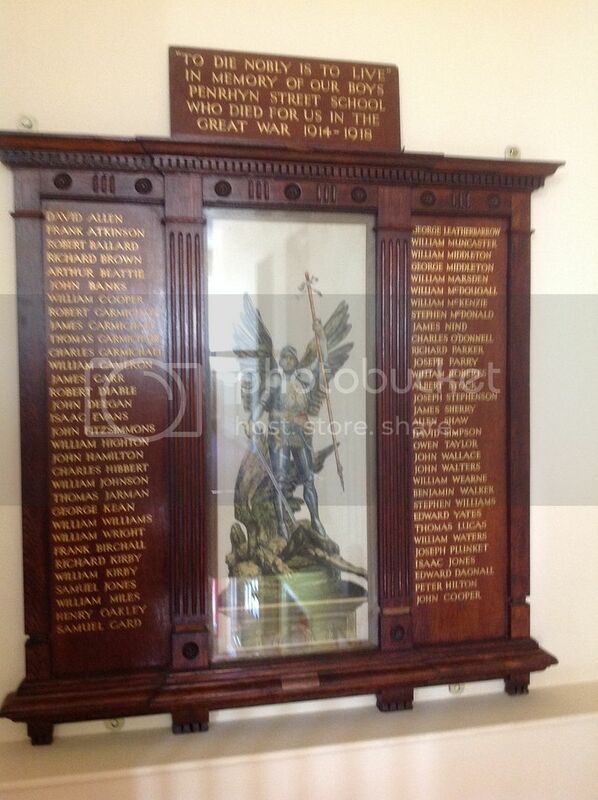 The Memorial was taken from Penrhyn School and reinstalled in the Lee Jones on the 11th of November 2014 by the Lord-lieutenant of Merseyside Dame Lorna Muirhead so I think they were all local lads who went to The school Leslie Black is the Chief Exec. of the Lee Jones. As on our other Project for St Cyprians, it would be an advantage to have a separate post for each of these heroes, so I will create these and please add any information on to the individual post rather than this collective one. George also has a booklet that has been produced by the lady doing this research, which he was going to pass to me this afternoon, however in the midst of the Help Desk and also sorting out passing the above photograph to me, this appears to have been forgotten but I'm sure he will get it to me soon. Once I have, I will take scans so that you can see the sort of work that has already been done on some of the names. Just want to thank George Highton for helping to get the 'forum' wheels moving on something which has become so close to our hearts here at the League. To reach the point we're currently at. we've used several different resources including the Penrhyn Street admissions registers. We soon realised from the age of some of the fallen that they couldn't possibly have attended the school which was built in 1912 but were more likely to have attended St Matthew's and St Polycarps, the 2 schools that were replaced by the new build. If any members find themselves in our part of Liverpool and would like to see the Memorial plse give me a call 0151 207 1984 (office hrs). Mary would you like another copy of the programme we printed for the rededication? I've been invited to do a talk to the Liverpool Family History Group on 13th May at 6.45 so can bring a few 'spares' along then too. Hi Lesley, I hadn't realised that the person looking after this was also a member - how great! Thank you for the update on your research and we'll help as much as we can. The programme had slipped on the floor last week and was picked up by Kathy not realising that it had been passed to me by George, I have it now and will scan it to show our other members, but thanks for the offer and we look forward to seeing you at our May meeting. Lesley Black wrote: Just want to thank George Highton for helping to get the 'forum' wheels moving on something which has become so close to our hearts here at the League. And don't forget the pictures of my Great Aunt Phoebe on a Derby and Joan outing to New Brighton with the League. I have added the remainder of the names for which no information has so far been gathered. Maybe we can pick up this project again and collect more details? MaryA, page 63 of the new Liverpool Family Historian you wrote "Our Forum is trying to help identify and create a short biography of those named on the Memorial and any input you could help with would be very welcome"
I'm not familiar with this memorial so came for a scout around. Nobody has posted here for almost a year or am I looking in the wrong place? This is the place Barbara, unfortunately some of the names are rather difficult to identify and we sadly let them lapse. If there is any help you can give, I know it would be very welcome. Not unless one of my brickwalls is on it!! The birth cert I got the other day for Maria Pritchard, she was born in Limekiln Lane hence my interest, sorry I can't help, I wish I could, are there no more details anywhere like service numbers or even which regiment they were in? The photograph you see above is the total of what there is except for the probable link of each man to the school.